I’m 14 weeks into this, and I must be behind. It seems progress has slowed in recent weeks, but with no deadline for completion and no completely clear picture of what the final goal is, I can as easily say I’m on track as behind. 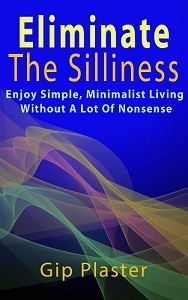 Looking for inspiration this week, I browsed a few blogs on minimalism and simple living. I found one decluttering idea I liked: a totally clean kitchen counter. (It came from this post.) Why should a counter — which is really a work surface — also be a place where things are stored? This week, I started clearing off the kitchen counters, and, as usual, one thing led to another. Although the counters aren’t completely clear yet, the cell phone charger has been moved to a table by the door, the slow cooker is stowed under the counter and the blender has been cleaned up — again — and is also living beneath the surface. In order to get the olive oil bottle off the counter and the seasoned salt off the back of the stove, I had to find a place to put them in the cabinet, and that meant cleaning off the spice shelf — almost completely eliminating everything because most were well beyond their “best by” dates. I also finally eliminate the plastic drawer thingy that holds the food storage container lids. For some reason, David decided years ago that storing lids separate from their containers took up less space in the cabinet — and the drawer on the counter has bothered me ever since. The lids are with the containers now, although they aren’t organized as I would like them yet. A pile of lids for which I have no containers is ready to take to my mother’s place tomorrow. If she doesn’t have the matching containers, they’ll go in the trash. While I can’t say I’m completely satisfied with what I’ve accomplished in the kitchen so far, the pile of items ready for the charity shop is growing again and the trash dumpster is fairly full this week, definite signs of progress, whether I admit them or not. Because I’m working on a repricing project for my bookselling business and I also changed the blog’s theme today to make it easier to read recent posts (goodbye Tuaug4, hello Titan), my head is spinning from tiredness and with ideas. That isn’t bad, I suppose, but I do feel pulled in several directions, all of my own making.